Kearns Fruit Farm was established over forty years ago on the family farm at the foothills of Mount Leinster. Originally started by Pat Kearns, we began growing fruit for jam production and canning back in the 1950's. 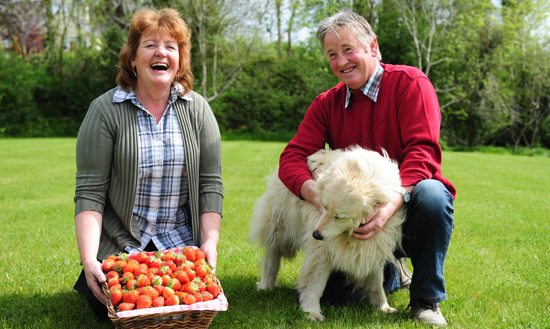 The farm has now developed into a large family run business producing and growing soft fruit for the Irish market. It is now run by Jim, Susan and son Noel, daughter Patricia and son-in-law Damien Fitzhenry. Being in the fruit business for many years, Jim has represented fruit growers and campaigned at local and national level to ensure a constant presence for home produced fruit on Irish supermarket shelves. When 99% of all fruit grown was for the former Chiver's factory up until 2000 in Enniscorthy, he was chairman of the Wexford Fruit Growers Association. He is also a founding member of Wexford Fruit Producers ltd. and previously, Chairman of the I.F.A Fruit Horticulture Committee and the National Chairman of the Irish Soft Fruit Growers Association. With all our experience, we strive to produce the finest quality strawberries, raspberries, blackberries and jam and we are Bord Bia quality approved members. All of the produce we sell is guaranteed 100% Irish and we are members of Guaranteed Irish and Good Food Ireland. You can buy our produce locally, in national supermarket chains and other outlets across Ireland or buy direct from our farm outside of Enniscorthy. All visitors are welcome. We stock a variety of frozen fruit and jams throughout the year, with fresh produce available from April onwards. To our loyal long-time customers, we would like to say a special THANK YOU for all the years of support and friendship. In the meantime, we look forward to meeting our new customers and continuing to produce the finest quality fruit for your needs.